Cute untagged vintage dress for Muffie or Ginny with red rick rack around the neckline and arms and yellow piping trim around the bodice and skirt. The dress closes in the back with a simple hook and eye and a removable vintage red plastic belt that buckles in the back (Muffie?). 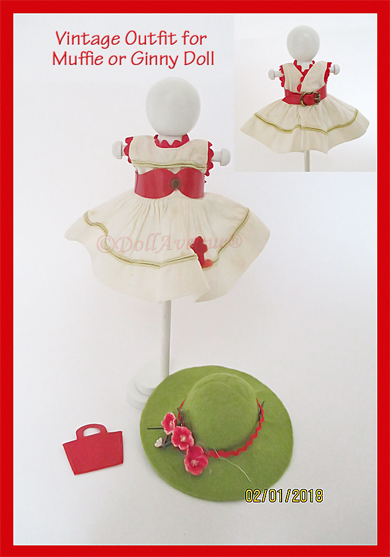 Completing the outfit are a vintage lime green sombrero-style felt hat with red rick rack and pink flowers and a Muffie-style red purse.